what’s behind all that text? The old adage ‘a picture is worth a thousand words’ is interesting. If a picture, or in this case, an illustration, was created with the knowledge that it would appear along-side words (in a poster, magazine or ad), then can it stand alone and speak volumes, when all the words are removed? A year ago this very conversation was taking place at my house and my girlfriend suggested that it would be really fun to go back to some of my posters and remove all the band names, festival titles, dates, sponsor logos, etc. to reveal the illustrations on their own. I gave it a shot, stripped away the text and logos. 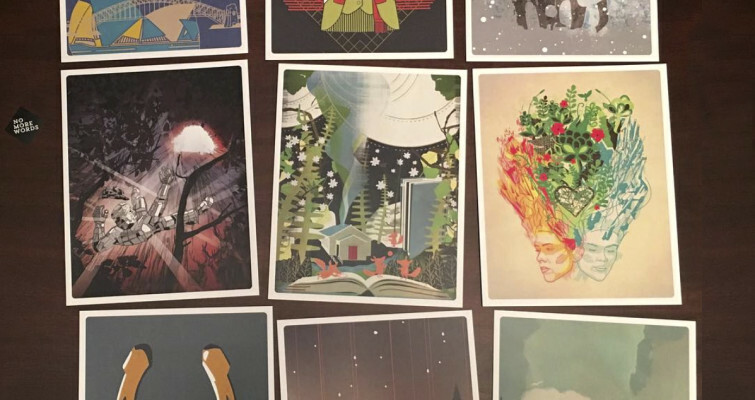 Here are eight past projects I revisited, along with the originals. What do you think? 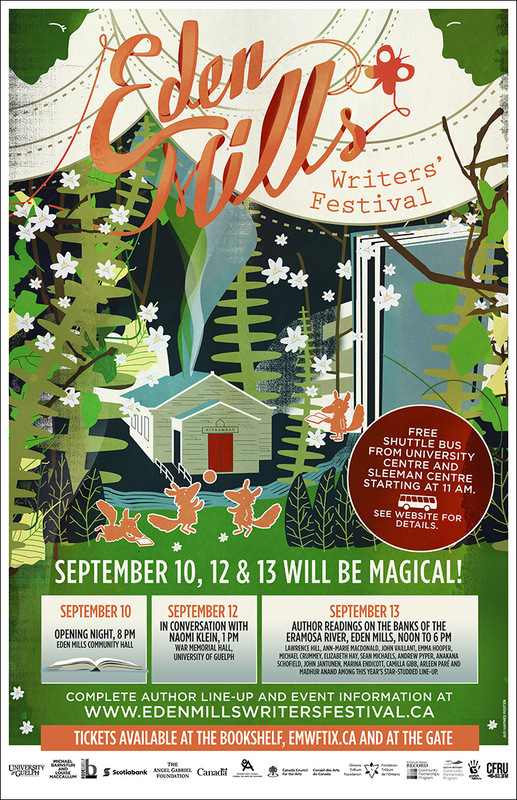 This poster was designed for a writers’ festival in small town Ontario. The festival takes place outdoors and features events for adults and kids of all ages. The idea was to come up with a magical world that was cute and fun (and full of books). I love how this one looks with and without the words. 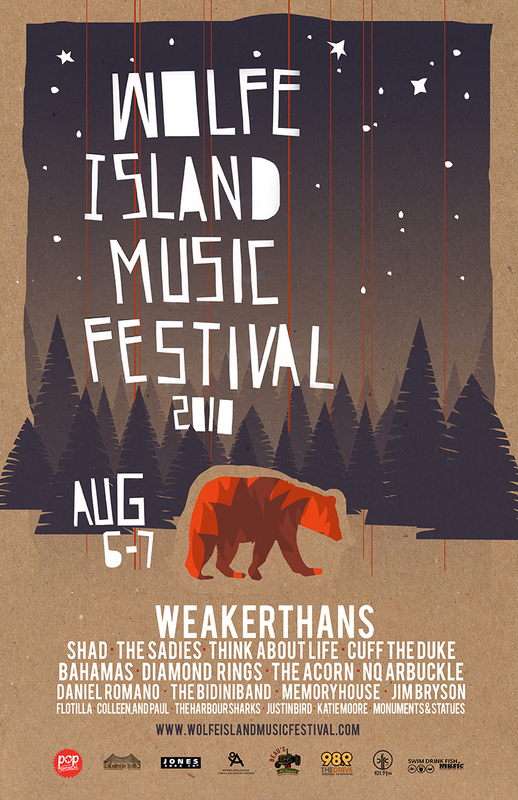 I’ve been designing posters for the Wolfe Island Music Festival for years, this was the first one. 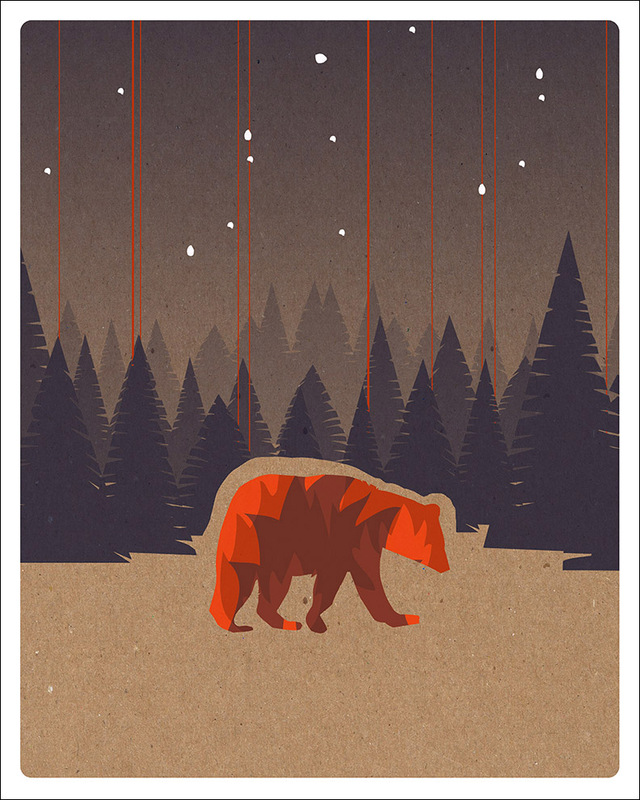 The trees, bear, (and text) were cut out of paper. Are there any bears on Wolfe Island? nope. This has probably been the most widely known, in the design world, poster I’ve made as it won an Applied Arts Award and has been featured on lots of design blogs. 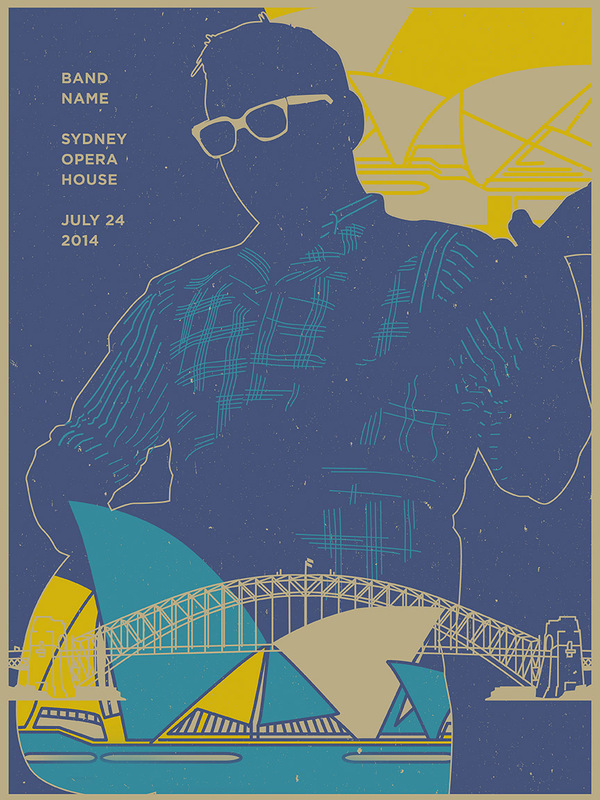 This illustration was done for an artist I work with that was headling the Sydney Opera House in Australia for the first time (you can probably guess who by looking at the illustration). Timing was tight and the poster was never used – I’ve always loved how the colours worked together and think it would have made a slick looking screen print. The original isn’t that different since the typography was so small in the overall design. 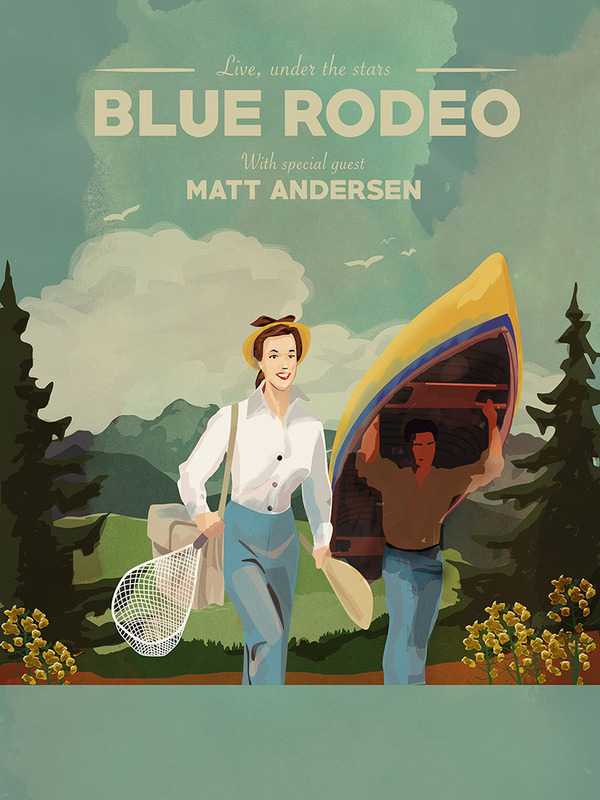 Every year Blue Rodeo play at the Molson Amphitheatre in downtown Toronto. 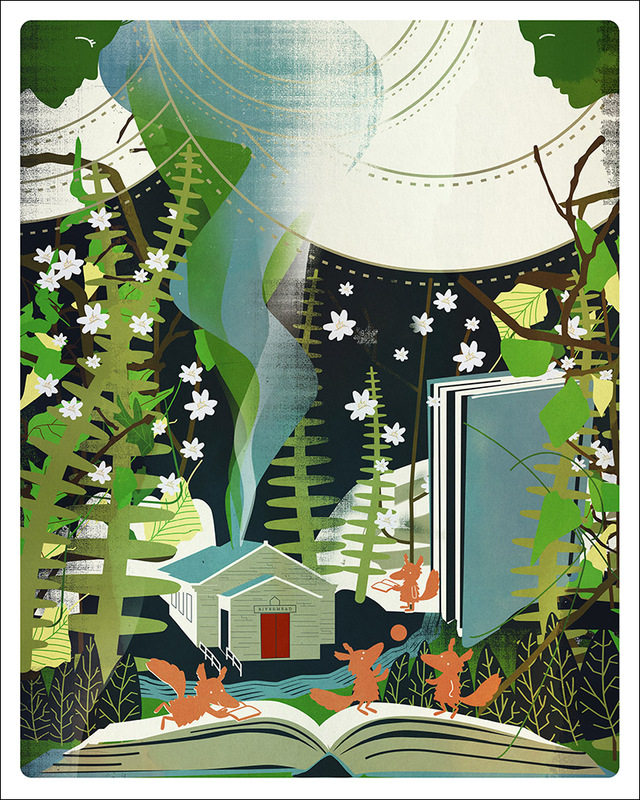 This past year, I was asked to create an illustration that said ‘the great outdoors’. 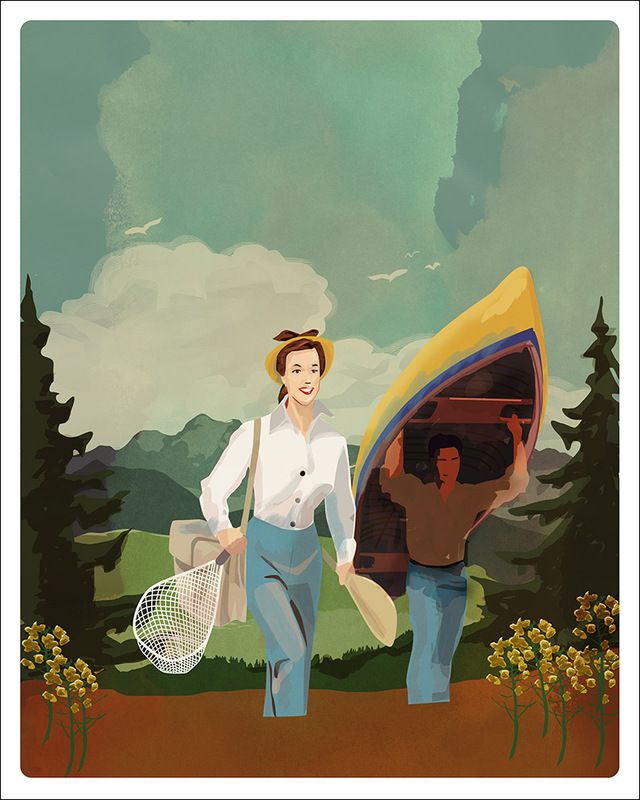 Nothing says ‘the great outdoors’ like a couple heading out for a day of fishing and canoeing. This illustration was my first time attempting ‘digital painting’ – I watched a couple youtube process videos showing digital painting and knew it was something I wanted to try for myself. I have worked on a few more images since using this technique and love it. There were print ads that featured logos, ticketing info, etc, but I haven’t been able to find one. The only image I have to show an original is of my first mockup I did which just had the band names on it, nothing more. 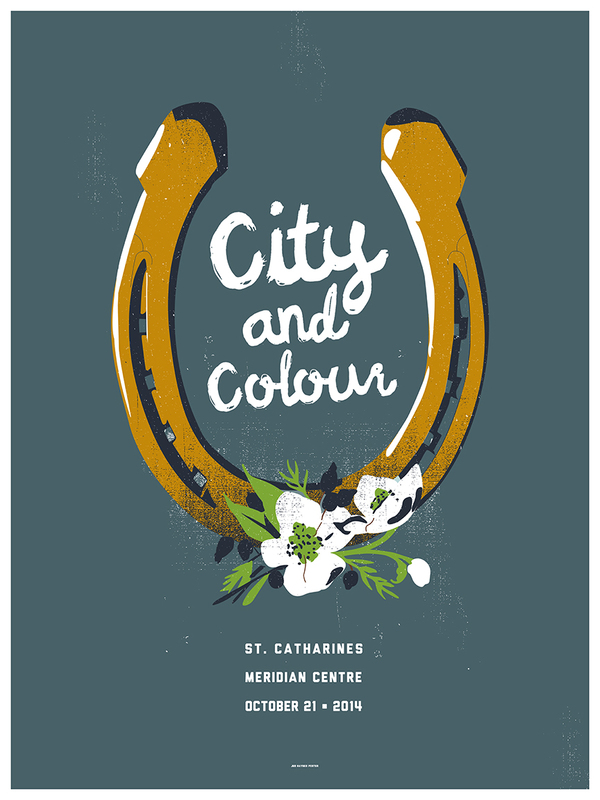 For the grand opening of the Meridian Centre in St. Catherine’s, City and Colour was hired to be the first concert. He wanted me to make a clean poster that represented St. Catherine’s, part of the golden horseshoe. These were hand screen printed and sold at the show, and one super huge version was printed on a flag and hung from the ceiling of the arena for posterity. 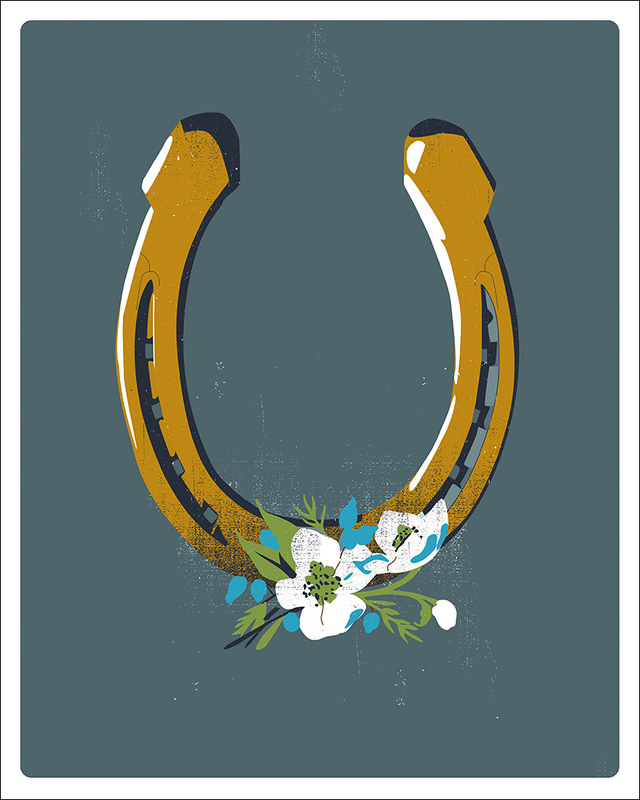 I think the horseshoe stands alone beautifully without the words. 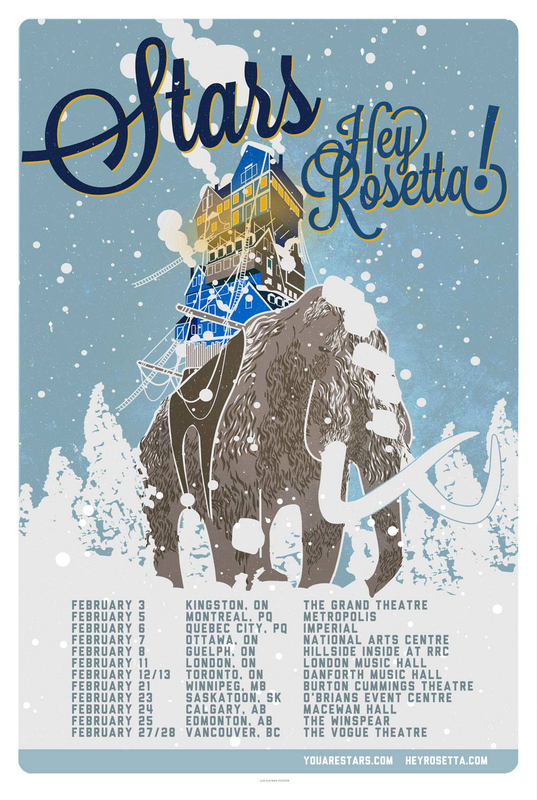 This illustration was created for a Canada tour poster, featuring indie-bands Stars and Hey Rosetta. 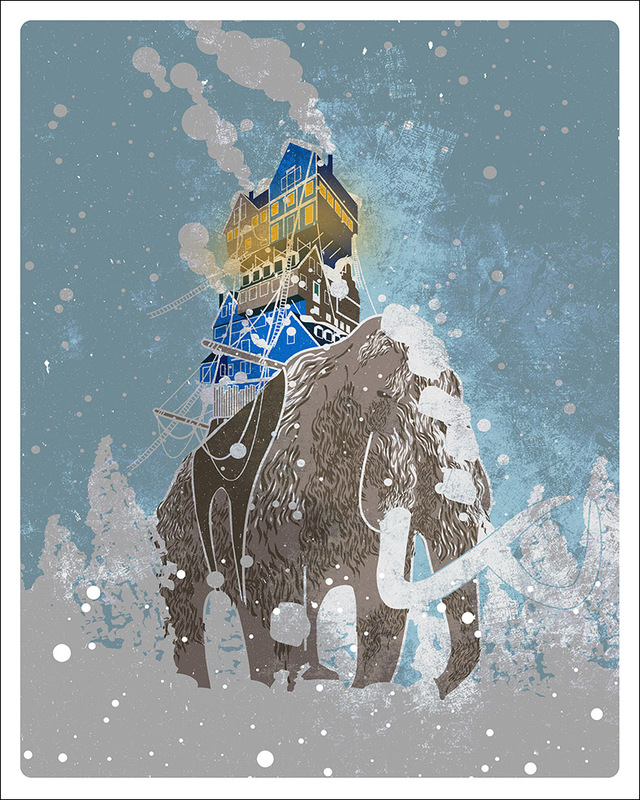 The two groups were on the road in the dead of winter and I felt the image of an ancient woolly mammoth trudging across cold terrain at night, while the bands and concert goers were kept safe and warm inside, would be cool. 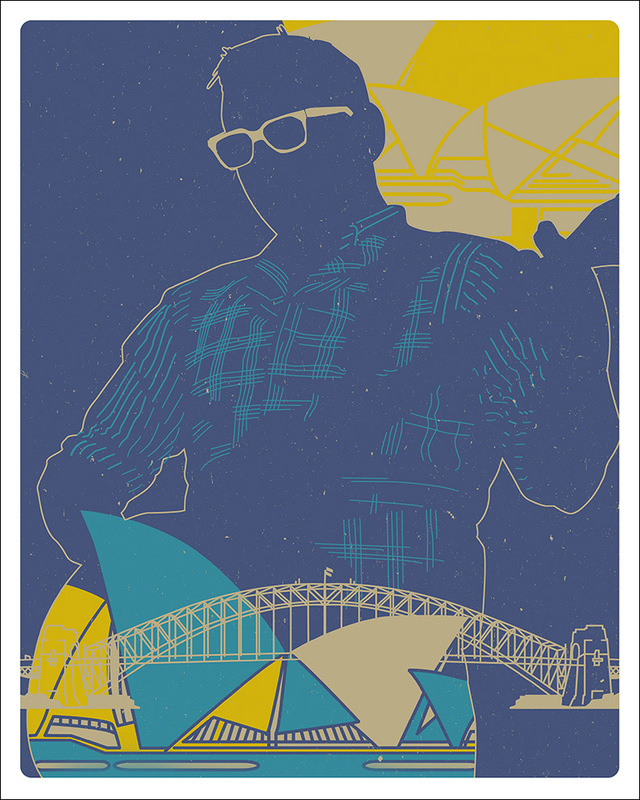 18” x 24” screen printed versions of this poster were also made and sold at the merch table on the tour. A client was playing a show at The Commons at Niagara on the Lake. I researched the area and found out they were a training camp for Canadian soldiers for the War of 1812. This green jacket was the uniform they wore. 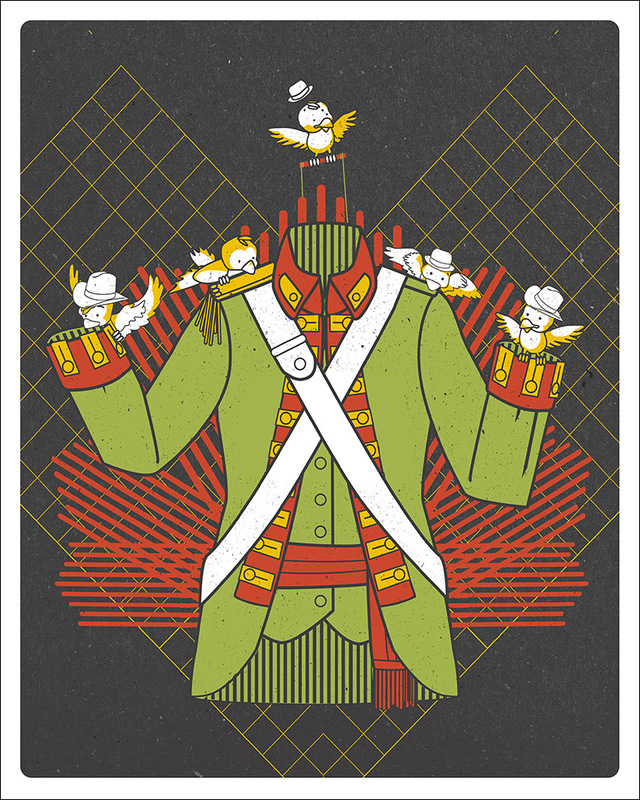 Drop in some Cinderella inspired birdees and you’ve got a historically relavent, yet still fun, concert poster. 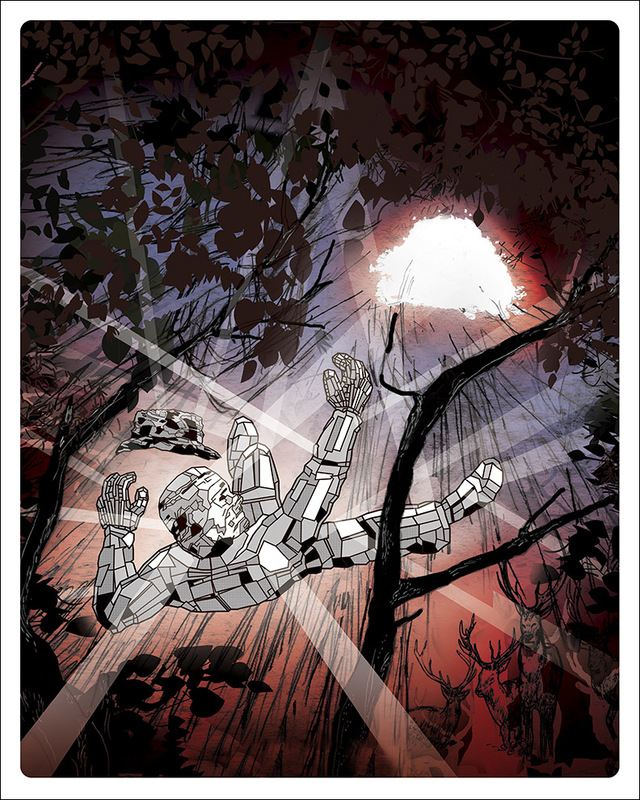 This is one of my favourite posters I ever worked on. Arcade Fire’s ‘Reflector’ introduced the world to a ‘mirror-man’. 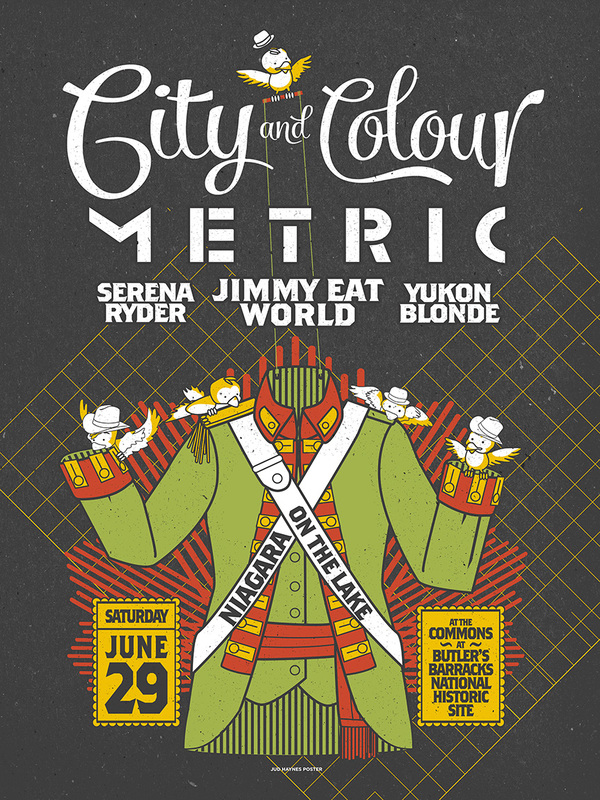 This poster was created for the band’s 2015 Polaris Music Prize short list nomination. 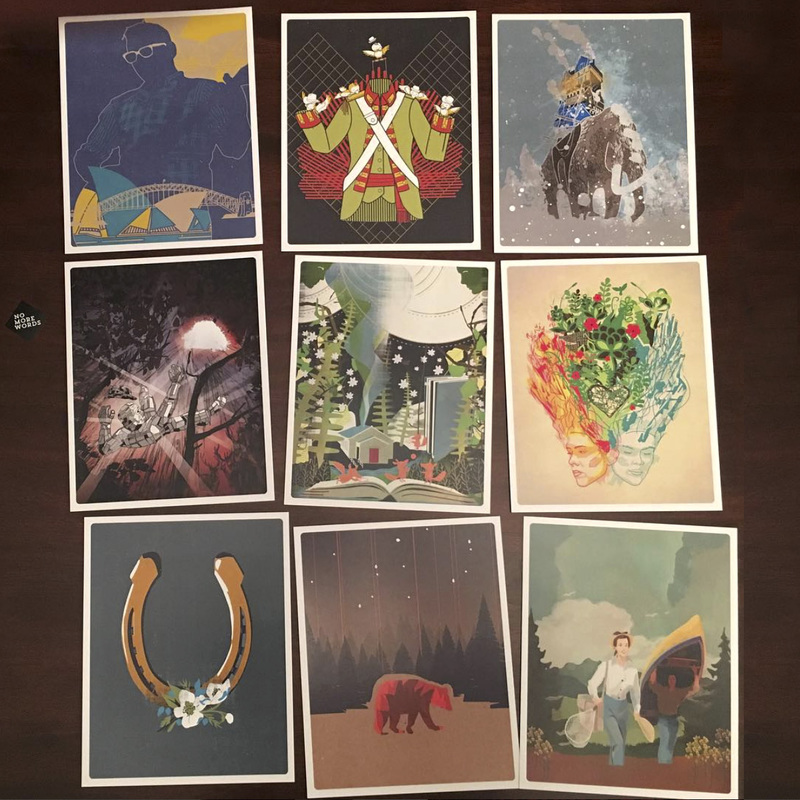 A small run of 50 posters were created and sold for charity by the Polaris Music Prize folks. Learning how to make the light gradients radiate off of the mirror man, and have them print properly when screen printed was a challenge, but always fun learning something new. 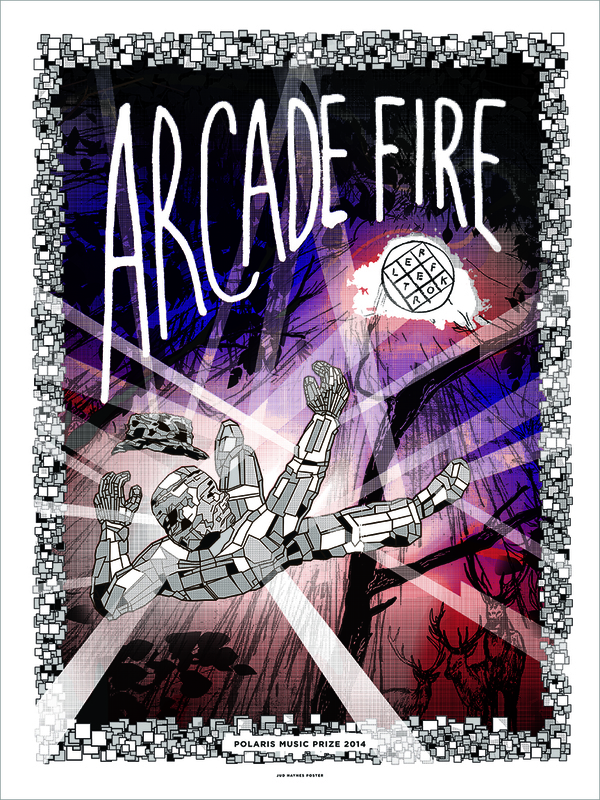 Arcade Fire didn’t win the award but this poster was a lot of fun to work on. I hope you enjoyed this little experiment. I encourage you to try removing all the words and logos from your posters and ads and see which ones shine on their own. I’d love to see the results, send ’em along. Your work is incredible. Your reflections give an interesting perspective on the creativity and strategy behind your work. Thanks Caron!! Its certainly a lot of fun. 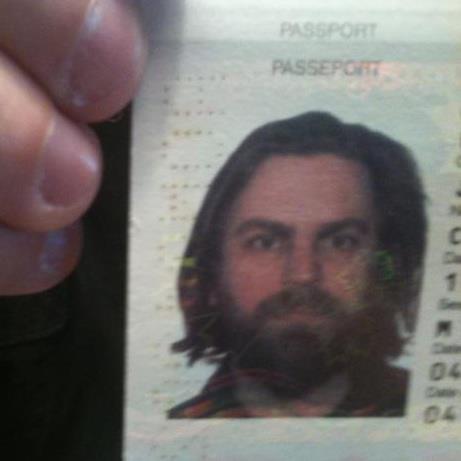 Jud Haynes is a freelance Illustrator and Graphic designer living in St. John's, Newfoundland. Remove the “R” and your name would be “GOD”.